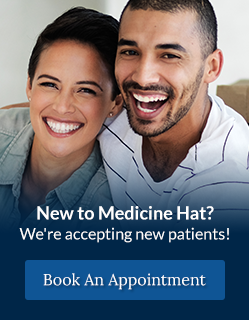 The dentists at River Dental in Medicine Hat, Alberta will customize your cosmetic treatment with veneers for a healthy looking smile. Porcelain veneers are ultra thin, custom-made porcelain coverings, which are placed over your existing teeth to improve their appearance. One veneer can be placed to fix a single damaged or misaligned tooth, or multiple veneers can be used to change the appearance of your teeth. Why are they made of porcelain? Porcelain is a very strong and durable material, resulting in a veneer that is resistant to breakage and can, in most cases, stand the test of time. Porcelain veneers do not change colour or stain, resulting in a veneer that remains the ideal shade for your smile. You may be a good candidate for veneers if you do not have any untreated cavities or periodontal disease. Additionally, the teeth to which you wish to apply the veneers must be in good condition, with sufficient enamel. Patients who clench or grind their teeth are not usually good candidates for veneers, as clenching or grinding may chip the porcelain.